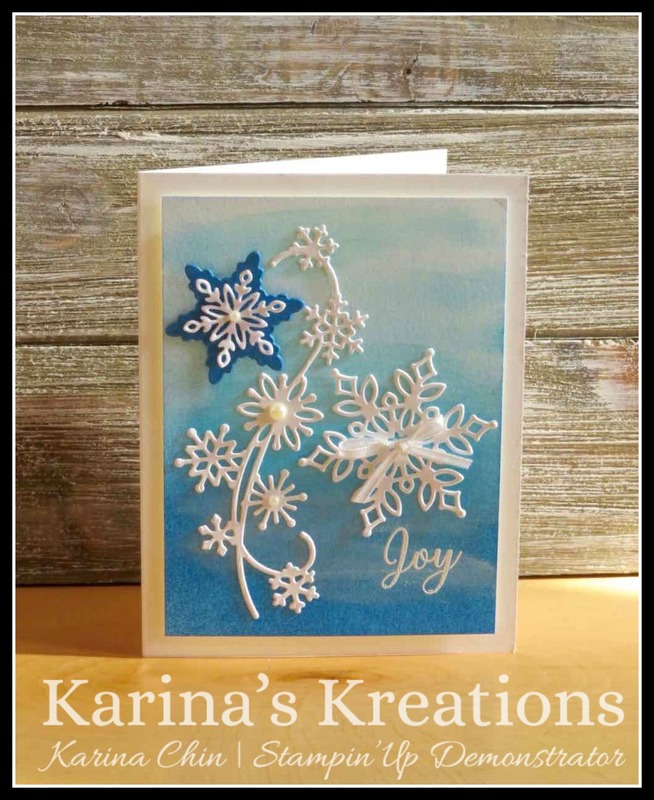 Karina's Kreations: Snow is Glistening Card! Stampin'Up has a new bundle of products available Dec 1. If you have a demo number you can pre-order these products today. We made this cute card at my team stamp night. This is the new Snow is Glistening Stamp set with the Snowfall thinlits. 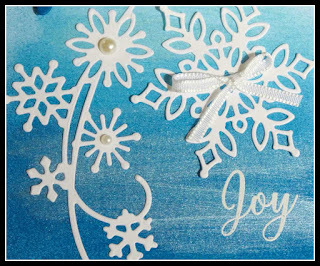 Score 5-1/2" x 8-1/2" Thick White card stock at 4-1/4" to create a card base. Cut 3-3/4" x 5" Thick White card stock. Brayer Pacific Point ink over the card stock using a sponge brayer. Start from the bottom and work your way to the top. I added 4-5 layers. Let dry or set with a Heat Tool. Using a Sponge Dauber, Spread Frost White Shimmer Paint along the back ground. Let dry. Stamp the sentiment with versamark ink. Emboss with Whisper White embossing powder and a Heat tool. Cut snowflakes out of Whisper White card stock and attach to the card. I used Mono multi glue. Cut a snowflake out of Pacific Point card stock. 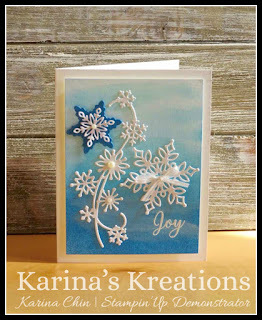 Cut a snowflake out of the White Velvet paper and attach to the card. Add Pearls and Whisper White 1/8" Sheer Ribbon to the card. Was looking for somewhere to subscribe to your newsletter or blog? I love this card. I have my supplies for snowflakes, I love it! Thanks Gloria, in the top left there is spot to follow my blog by email. I can add you to my newsletter. Send me your email to kchin2@telus.net. If you click on my picture, it takes you to my business facebook page. I just posted a facebook live video using the snow is glistening stamp set.